Women on the Land: Uprooting the Bitter or Making it Sweet? Uprooting the Bitter or Making it Sweet? Rosh Hashana is not just about eating apples with honey and munching on honey cakes. Before we can even get to the sweet, we need to eradicate the bitter. Parashat Nitzavim, which always precedes Rosh Hashana prompts us to uproot any bitter root from within us. Bitterness comes in many forms, and we all have our own private bitterness. When we have a bitter taste in the mouth, everything we eat tastes bitter. This is why, for example, nothing tastes right when we are sick. Bitterness can come in the attitude of judgment, looking for the fly in every half-empty cup. Always wanting more, and never being satisfied. Often when we are insecure, we project the bitterness of our insecurity into judgment of others. We make ourselves believe that if we are better than those incompetent, lazy, irresponsible people, then perhaps we are not so bad indeed. Now is the time to develop a good eye and look for the sweet points hiding behind the bitter façade. This is like picking out the sweet red ruby looking pomegranate seeds from their bitter pith and rind. When we feel isolated and disconnected from others, then the taste of bitterness overwhelms us. Being united causes the bitterness to be absorbed and diluted, like the bitter herb included within the eleven herbs of the sweet incense. Sometimes we may enter a bitter situation – a real life challenge. Then it is unfortunate if the circumstances become unnecessarily more embittered by division among close relatives. Now, before Rosh Hashana, we have the opportunity to sweeten the bitter with unity and love between sisters. We can pick up that phone or write that email expressing how sorry we are for having caused pain to our dear ones, and do everything in our power to reconcile and reunite the natural loving bond between us. This week’s parasha directs us to stand in unity prior to coming before Hashem in judgment on the big day. “You stand this day, all of you, before Hashem your G-d – the heads of your tribes, your elders and officials all the people of Israel, your children, your wives, even the converts within your camp, from woodchopper to water drawer to enter into the covenant of Hashem your G-d…” (Devarim 29:9-11). We are not only judged as individuals on Rosh Hashana, but moreover as a family, a community, and a unified people even a universal world. As we celebrate the birthday of Adam the first human being on Rosh Hashana, who included all future people, we are judged for our efforts to become one. At the anniversary of eating from the Tree that caused our current split reality, we have the greatest opportunity to rectify and unify. At this time, we seek forgiveness from one another in order to face Hashem at the onset of the New Year clean of grudges, bitter strife, and family feuds. This week’s parasha prompts us to eradicate the bitter within our midst, which causes “utter ruin of moist and dry alike” (Devarim 29:18). This deadly poison is described as poison-weed and wormwood. “Perchance there is among you a man, or woman, or family, or tribe, whose heart turns away this day from Hashem our G-d, to go to serve the gods of those nations; perchance there is among you a root that bears poison-weed and wormwood” (Devarim 29:17). I have not been able to identify רֹאשׁ/rosh – poison-weed which is sometimes translated “gall.” Rashi explains that it is “a root that brings forth herbs as bitter as wormwood plants, which are very bitter” (Rashi, Devarim 29:17). Similarly, poison is called רֹאשׁ/rosh – head because it is the head of all bitter herbs, it is bitterer than anything else. It may also possibly be called rosh, because the poison is found in the head of a snake. לַעֲנָה/l’ana, translated wormwood, derives from the words לְעַנֹּת נָפֶשׁ – “to afflict the soul,” as taking this herb causes great affliction (Rabbeinu Bachaya, Devarim 29:17). Ramban explains that these herbs are either bitter or deadly; one is called “rosh” because it is the most bitter of all and head of all bitter herbs. The second is called “l’ana” from the language of being humbled (Shemot 10:3), for he who eats it will suffer and be humbled in his soul. As we enter Rosh Hashana – the head of the year, we are confronted with cleaning out the rosh – head of the bitter. The word rosh, which doesn’t seem to refer to any particular herb, may allude to the fact that the beginning is the time for taking the most delicate care that the balances are correct (Frank Herbert, Dune). The head of the bitter herbs stands in contrast to the head of the, hopefully, sweet year. “Well begun is half done.” Everything turns out according to the beginning. Just a small deficit at the beginning can develop and bring about many more deficiencies afterwards. If the root is bitter, it will affect the forthcoming flowers and fruits. Therefore, we need to put the greatest effort into making our beginnings as perfect as possible. This is why the first fruit offering must be with all our heart, soul and might. There is nothing more important than starting anew on the right foot, with extra effort and devotion. At the beginning, we need to mobilize and connect both body, soul, mind, thought speech and actions (Shem M’Shemuel, Parashat KiTavo, year 5675). The bitter fruit of “poison weed and wormwood” is a parable for all bitter things. First and foremost for the division and hatred among us (Introduction to Kabbalah 2:1 on Chanukah). It is not that Moshe our teacher, G-d forbid, was concerned that there were idol worshippers among us. Rather, he was concerned that there were division of heart among us caused by arrogance. Whoever is arrogant is compared to idol-worship (Sotah 4b). When we have an arrogant attitude, we think we know better than our friend, and are unable to accept his or her outlook. We only care about ourselves, “thinking I shall be safe, though I follow my own willful heart” (Devarim 29:18). We therefore, lose the ability to feel the pain of our friend (Yismach Moshe, Parashat Vayechi). With division of heart, we cannot adapt ourselves to become part of the general community of Israel. When we unify with the general community of Israel we partake in its general holiness. It is this holiness that enables the Kohen to enter the Holy of Holy and emerge in peace, because he is the shaliach (emissary) for the community of Israel. Surrendering to the general community warrants humility. Through this humility, we learn to see the greatness of others, transforming our bitter judgmental outlook to become sweet and accepting. The Targum translates “poison weed and wormwood” as a person’s thoughts of sin and iniquity. On Rosh Hashana the Shofar cleanses and purifies the brain from these kinds of negative thoughts. This is alluded to in the initials of שֹׁרֶשׁ פֹּרֶה רֹאש/Shoresh Poreh Rosh – “a root that bears poison-weed,” which spells out שׁוֹפָר/shofar. After the Shofar has cleansed the brain from all traces of bitterness, the light of teshuva and purity flows upon us. This is one of the reasons why a shofar is called a shofar from the language of משפרת את הולד/meshaperet et hav’lad – “improves the baby” (Rashi, Shemot 1:15 explaining why Yocheved was called Shifra because she would improve the baby). When the Shofar washes away our bitter thought, we become like a newborn. We then have the ability to receive a new soul, just as Yitzchak received a new neshama during the Akeida (Yismach Moshe, Parashat Ha’azinu). Whereas the plant for which Wormwood is named, Artemisia absinthium, or Mugwort, Artemisia vulgaris, is a known Biblical metaphor for things that are unpalatably bitter, it also refers to a common herb growing in my garden. 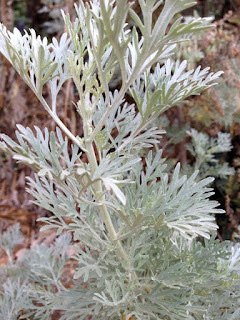 Because of its antiparasitic properties, it is recommended to place wormwood tea in a spray bottle and use it to spray plants for insects and other pest. Wormwood is a common ingredient in many herbal cleansing formulations. As the name implies, wormwood is a powerful worming agent that has been used for hundreds of years to expel tapeworms, threadworms, and especially roundworms from both animals and people. Wormwood moreover, counteracts digestive disorders as well as gall bladder disease and it may lower fever. Some people apply wormwood directly to the skin for healing wounds and insect bites. Wormwood is one of the major ingredients in absinthe, a popular drink in the nineteenth century that became associated with the death of the American writer Edgar Allan Poe and the suicide of the painter Vincent Van Gogh. This drink is now banned in many countries because of the potentially poisonous chemical thujone found in wormwood. The concentration of thujone increases when distilled in alcohol. Whereas wormwood in the Torah is a metaphor for disunity, arrogance, thoughts of sin and even idol-worship, it can be employed to purge ourselves from the bitterness of worms, pests, digestive disorders and more. In the Torah, we learn that bitter waters can be sweetened by bitter wood. The bitterness of wormwood, as well, has the redeeming quality of alleviating the bitterness of worms, parasites, indigestion and more. There is a Chassidic concept called ‘sweeting the judgment in their root.’ This implies the expanded consciousness of seeing the bigger picture of the bitter judgments and suffering in our lives, and how they are part of the greater good. Perhaps just a drop of absinthe from wormwood may help us reaching the level of sweeting the judgments in their root so we can learn that …“to the hungry soul, every bitter thing is sweet” (Mishlei 27:7). Why is this Land Flowing with Milk and Honey?